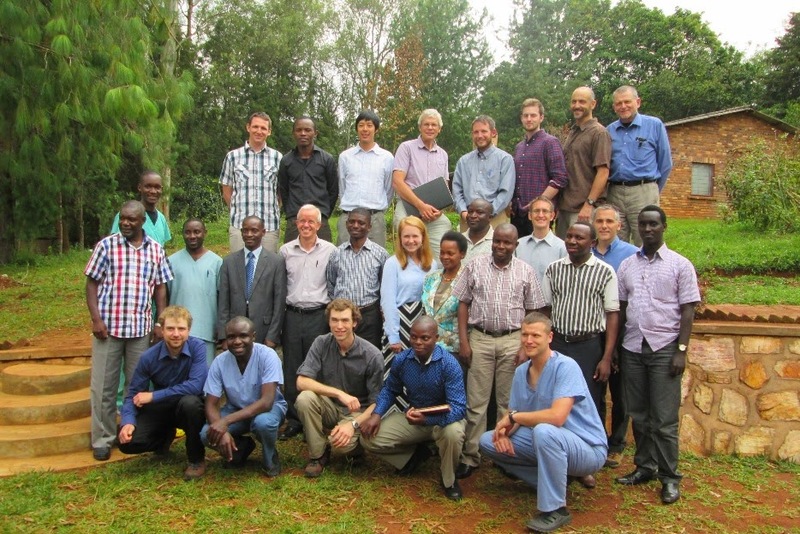 A few weeks ago, Kibuye gratefully welcomed a team from Engineering Ministries International who came to help with the development of thoughtful plans for the expansion of Kibuye Hope Hospital. This is the third time an EMI team has come to Kibuye. EMI has been hugely helpful in the past with mapping out strategic and responsible infrastructure growth here by creating a Masterplan for the Kibuye Hospital campus. As we implement hospital and community development, their expertise has been crucial. 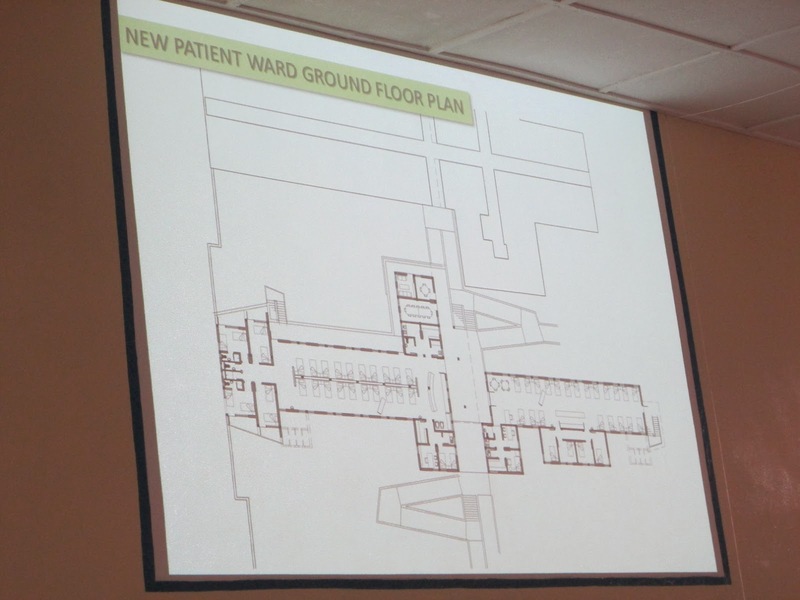 The focus of their time here was the detailed design of a 48 patient ward which we hope to start January 2016. This will not only create much-needed space for patients, but it will provide a well-lit, well-ventilated, and beautiful hospital environment. The team also marked out exact locations for basketball courts and football pitches (soccer fields), worked on large scale electrical and water/sewage developments, and proposed various landscape architecture ideas in order to fully capture the beauty of this place. 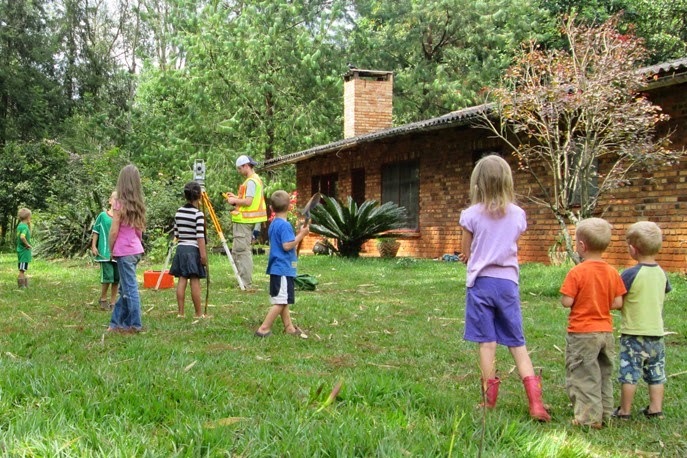 And the kids loved watching the surveying part of the work. 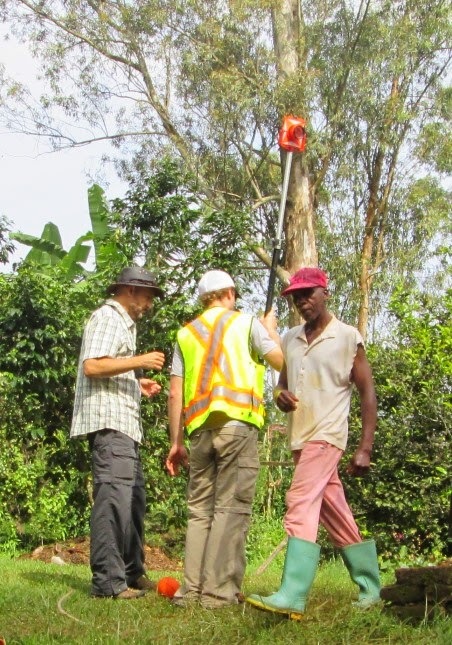 Thank you so much to the whole team for your tremendous help here for the future of Kibuye, and thanks also for your gracious attitudes, as welcoming 13 people all at once meant that beds were a bit hard to come by. Thanks Phil, Dan, Caleb, Tony, John, Stanley, Jonathan, Dave, Matthieu, Kesleigh, Tim, David, and Kevin! Today was my last day of work at Kibuye for 2015. We are headed back to the US in a couple weeks, after a Serge East Africa retreat in Kenya (the preparations for which are probably the reason for the recent radio silence on the blog). We will return in January. Our families are waiting for us. Our nieces and nephew that we've been longing to meet for over 2 years. Our hearts are full in the waiting. And there will be also be the joy of entering our "home culture". Sometimes I wonder to what extent the US is still my "home culture", since, as the years pass, I'm not sure I fit in there the same way I did before. I forget what normal is. Glimpses of US life strike me as foreign. 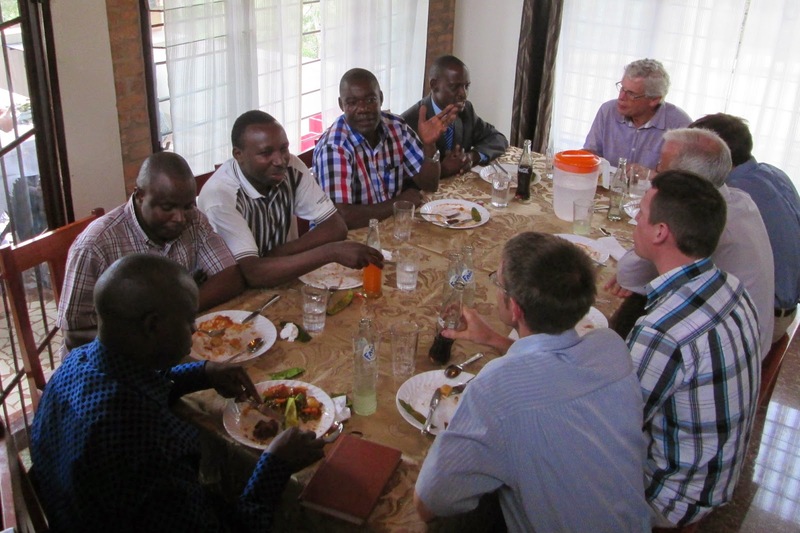 Maybe hanging out with my fellow Serge missionaries in Kenya will be a type of "home culture". But, a couple days ago, a brief conversation reminded me that yes, the US culture is still very much home. Rachel said something about the days when she is at home with the kids, that she has to change out of her pajama pants before the Burundian guy that works in our house arrives. Why is that? It's not that she is trying to dress up to a certain extent for someone who is not family. And it's not modesty. She can wear pants at home here with no one getting offended. It's because any Burundian is likely to think that it's weird to stay in old pajama pants, when you could spend the day in nicer (and more formal, and less comfortable) clothes. And we know that. So, you get out of the pajama pants. This is an example of the long-term "strain" of living cross-culturally. Because, in the US, everyone agrees that it's just nice sometimes to spend the morning relaxing in your pajama pants, and few of us would begrudge that to our neighbor or friend. In fact (and I think this is the point), the question would never even come up because, living in your home culture means that your values and preferences are those of the culture around you, and therefore you can just glide along with what is already ingrained in you. And that makes my heart yearn, here at the "32 months since leaving the US" mark. A yearning for it being easier. A yearning to not have a subtle, but daily and persistent, tension between what seems "right" to me, and what seems "right" to the culture around me. I would just like those things to automatically be the same, and so not have to think about it sometimes. There are probably those in the US that constantly feel like what they want is always at odds with the culture around them. I think we might call them "misfits". They don't "fit". And that must be terribly difficult. And in a sense, that is what you become when you live cross-culturally. The good news is that, for the most part, people expect you to be weird, "foreign", or in the best of times "exotic". But even with that extension of grace, it is still grace extended to the "misfit". There in its given place, and well. I am not that frog. Because we don't fit, we stand out. We are always the furthest thing from invisible. And if invisibility is a "sign of being at home", then we are not at home. And when you know that there is a place where you could be invisible, where your heart is not a "misfit" in the same way - it's out there, but you just haven't seen it in a very long time - that can be both a comfort and a further challenge. Or maybe it's just a good reason to be thankful on the eve of your return. Last Wednesday was my 36th birthday. Somewhere along the way, I guess I started to fall into the trap of thinking that on my birthday, everything is supposed to go “my way.” It’s my special day, all about me, etc etc. The kids are supposed to sleep in, I’m not supposed to have to work, other people will cook all my meals for me, and in general I will spend the day with my feet up eating chocolate. When I write it out, it sounds a bit ridiculous but never the less, those are the subconscious or slightly conscious thoughts rolling around in my head every time a birthday comes up. Well, things didn’t exactly go “my way” last Wednesday. For one thing, we were having medical visitors from Buja up for the day and I had agreed not only to meetings but to provide lunch for everyone as well. I figured it would only make the day slightly more busy. Ha. The medical visitors showed up minutes after the power cut out (which was to be a 28 hr outage, something obviously not known at the time). I pushed away thoughts of my failing crockpot dinner out of my mind and spent some time talking about cervical cancer screening. Half an hour later, we were ready to head up to the hospital to check out the ultrasound machine when a hospital worker came literally running up to my door. This is significant, because no one runs here. There was a lady at the hospital with a ruptured uterus. She needed help, immediately. While I was trying to rearrange the visitors’ schedules quickly, I received calls from both Eric and Greg, trying to get ahold of me for this emergency. Time to go. I spent the next several hours in the OR, performing a hysterectomy and trying to stop the giant puddle of blood on the floor from growing larger. The patient was on an adrenaline drip to keep her heart rate up and had actually received SIX units of blood (previously unheard of here). The rupture had started at the top of her uterus and continued all the way down the left uterine wall and then backwards into her retroperitoneum up towards her renal vein and artery. Friends, I was WAY out of my league. I put in stitch after stitch and finally stuck in a bunch of surgicel and started praying that the bleeding would stop. It did, or at least it stopped enough to close her up. I had minimal hopes that she would survive, but thanks to great anesthesia care (there’s a reason they call Greg the “Reanimationist” in French) she not only made it through the day, but I’m hoping she will be going home this week. Miraculous. The miracle wasn’t exactly the focus of my day, though. I returned home over an hour late to the lunch I was supposed to be preparing. The power was out the rest of the day. The phone networks were down. The kids were grumpy. What kind of a birthday was this after all? Blah. But now that a few days have passed, I’ve had some time to reflect. Greg told me that the chance to save a life on my birthday was perhaps the greatest gift possible. He did say it as a joke, but maybe he was right. Maybe the chance to focus on something other than “my special day” was really what I needed. What was it that bothered me so much about the day, the fact that I got to go and help a mother of 5 return home to her family and live a (hopefully) long and healthy life? Of course not, that’s one of the reasons I’m here. I think that the problem was that it wasn’t how I PLANNED the day would go. I wasn’t in control of the situation. I wanted my day to look a certain way and it didn’t. But who’s to say it wasn’t a better way to spend the day? Perhaps the birthday gift was, in the end, a stripping away of my closely held illusions of control. When are we ever, really, in control of everything around us? Perhaps the scattered, fragmented, crazy day was a reminder to me of who directs my steps, who holds me in the palm of his hand, and who is ultimately in control of everything around me. 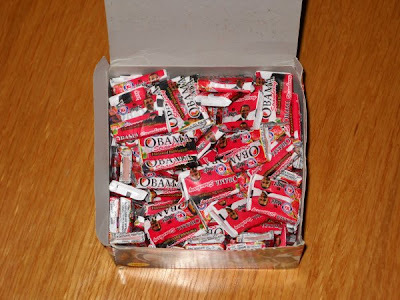 As some of you very faithful blog readers may remember, in early 2010, we posted this after encountering our first "Yes We Can-dy" in Kenya: Obama Gum. It remains a favorite phenomenon, and though it is Kenya that has a claim to President Obama, all of Africa feels a certain fascination with the American President. In fact, as enthusiasm in Kenya has waned a bit (seeing that Obama being President of the US means little for Kenyans), Obama Gum has become harder to find there. However, there is a pecking order for these things within Africa, and Kenya's leftovers get sent to...Burundi. So, we can still find Obama Gum here, though I don't like to think about when it might have been produced. 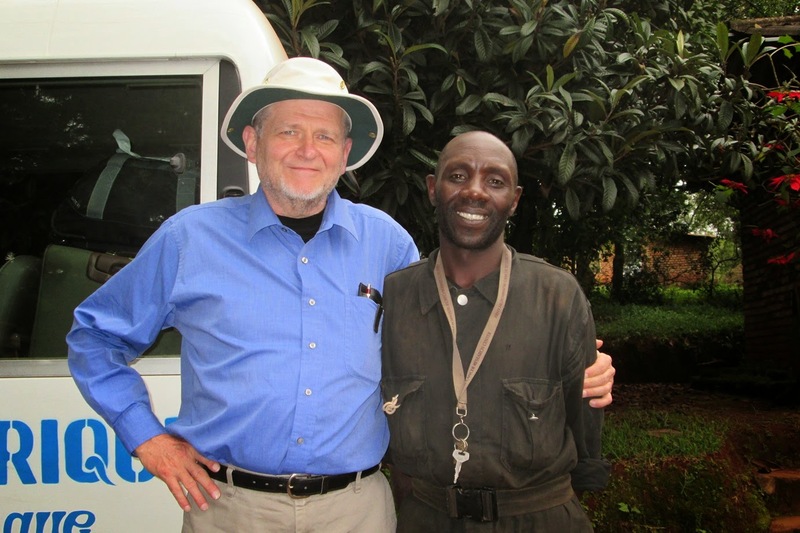 Last month, visiting DR Congo for the first time with the Eye Team, I was delighted to find that the Hero Gum is, in fact, quite egalitarian. 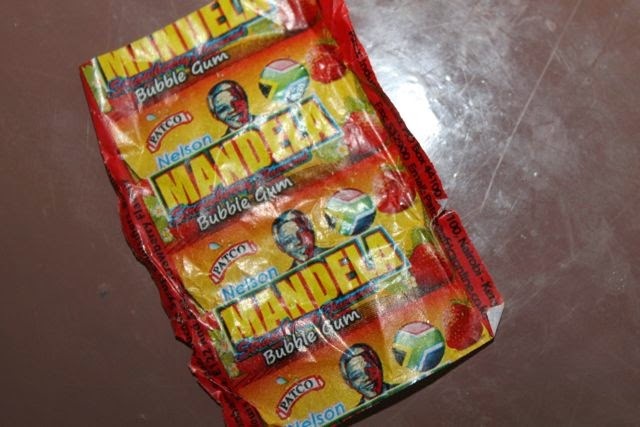 So, I'm happy to present to you another Hero Gum: Nelson Mandela. Seeing as though I only found the wrapper, I unfortunately cannot provide you with a side-by-side taste comparison, which (I think we can all agree) would have been absolutely fascinating. What this shows us is that, if one day we are able to post a photo of McCropder bubble gum, then all the world will know, with the utmost degree of objectivity, that the mission for which God has prepared us has been, in fact, fulfilled. 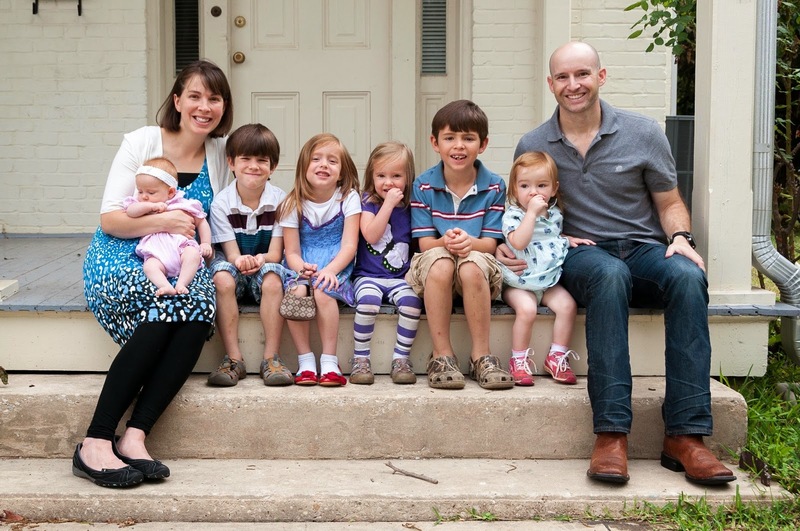 As you may remember, last year we announced that a new long-term family would be joining our team. 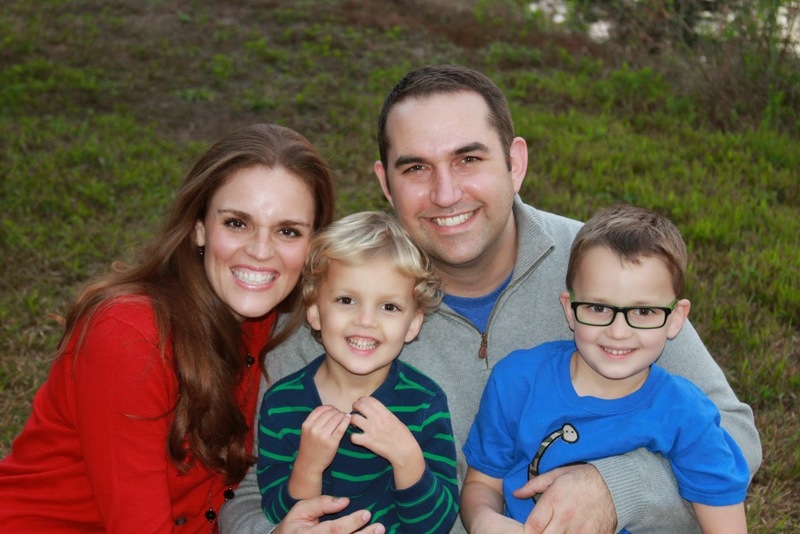 We are excited to welcome Caleb & Krista Fader and their son Liam to Burundi sometime this summer. They are completing their cross-cultural training and fundraising and will soon move to Burundi to begin Kirundi language study. It has also been a huge blessing to have a teacher with us here this year and she has decided to stay for another year. We are thrilled! She’s done a fantastic job with the kids and has also had a wonderful ministry with the medical students. Over the last few months, we have also officially added two other families to the team. 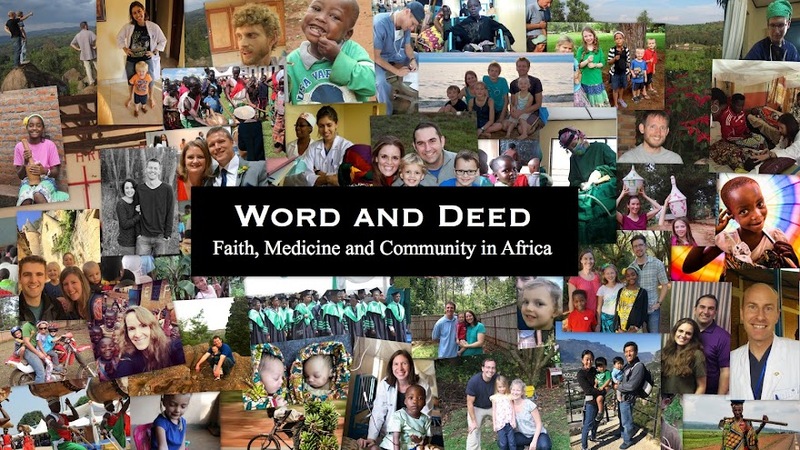 Darrell & Becky Baskin and Logan & Julie Banks have been accepted by Serge and have begun their support raising efforts to join us here in Burundi on a long-term basis. Both families are in the support-raising/training & preparation phase and hope to go to language school in France sometime in the next 12 months. Please join us in prayer for these families as they raise support, attend cross-cultural training, pack up their belongings, and begin language study. We understand the unique stresses and challenges of these phases of preparation, but also know how important they are. Just in case you were wondering, there are still some specific slots that we’d like to fill on our team. Stay tuned for more info on folks that we’re looking for (both short-term and long-term)! 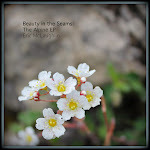 I wanted to give everyone an update after the maternal mortality and postpartum hemorrhage blogs. About six months ago I was over at Alyssa’s house and we were discussing a course she was teaching called “Helping Babies Breathe.” It’s a pretty awesome way of distilling newborn resuscitation down into a few simple, easy steps that can have a profound impact on short term and long term survival for babies. A company called Laerdal Global developed the curriculum and sells newborn models (complete with lungs, pulsating umbilical cord, etc) at cost to developing countries with high neonatal mortality rates. They are called “NeoNatalies,” ha ha. She was essentially teaching me the course because unlike in the US, the delivering nurse or obstetrician is usually the person who does the newborn resuscitation, not the pediatrician (see previous post about the “Knock at the Door” and response times....). As I was reviewing the materials, I noticed a line about other products from Laerdal, including something called “MamaNatalie.” Of course this caught my eye and I went online to learn more. This company has also developed a low cost model of the uterus and a curriculum entitled, “Helping Mothers Survive.” It’s essentially a curriculum for lay midwives and community health centers that don’t have physicians, but I figured I could adapt it for our purposes. So, thanks to some generous donations from you guys, I went ahead and purchased 2 MamaNatalies for our students. I am currently in the middle of teaching a 40 hour Obstetrics course to our current 4th yr med students (that translates to their first clinical year). Every few weeks we’ve taken a break from lectures to do simulations. The class breaks up into 2 groups (we have an awesome intern here named Molly who is starting med school in the fall and has been helping me with these simulations) and take turns practicing skills like delivering a breech baby, managing a shoulder dystocia (stuck shoulders after normal delivery) and treating postpartum hemorrhage. I’ve said it before and I’ll say it again, I think that of all the lifesaving interventions our students can learn, managing postpartum hemorrhage (and also, probably even more important, newborn resuscitation) are the most important, highest yield skills that will save the most lives. So I am super excited that with our MamaNatalies, the students aren’t just learning about this by reading a book or listening to a lecture. They can actually do hands on training, estimate blood loss, practice essential skills so that when the real thing comes, they’re ready for it. Thanks to all of you who have contributed to this project! Hopefully in the future we can expand this training not only to med students, but nurses, nursing students, and midwives as well. There’s a lot of potential in this country...much change is needed, but we are already starting to see some fruits as well.